NASA and the U.S. government’s very first effort to map carbon dioxide in the Earth’s atmosphere by using space technology ended in a fiasco a few weeks ago. The rocket carrying the Orbiting Carbon Observatory (OCO) made a crash landing into the Pacific Ocean and that was the end of that. It’s a true shame it happened because the information OCO potentially could have relayed back to earth would have provided vital information and potentially led to more focused efforts to combat climate change. But for those with their feet firmly planted on the ground, there’s a lot more to life than NASA’s occasional debacles. Mapping and cartography is coming of age as we speak and the combination green+map happens to equal adventure galore. Many social networks would be envious of the viral contagiousness of this equation. This is no paid post nor will I accept gifts after the publication of my songs of praise, but guess what – I am all over Greenmaps.org. The organization facilitates communities, schools, businesses and individuals to map their local environs in terms of environmental activities. To date, over 300 green maps of locations, regions and countries have been submitted to the site, covering all major towns and cities of this world. People negotiating the maps can browse by location (the standard way) or use themes such as “cycle paths”, “green shops”, “specific green initiatives”, “gardens”, “energy resources”, “green public projects” and lots more. You’ll find anything you need to live your green lifestyle anywhere on earth. Literally! The maps make use of user-friendly icons created by Greenmaps, including icons indicating wheelchair accessibility, child friendliness and public transport options. Mapmakers can include photos and even video material. 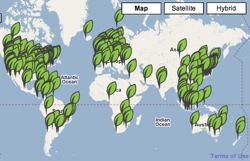 The Greenmap’s success is a great example of how thinking globally by acting locally works in practice. “This is the first time that comprehensive information about locally available reuse opportunities has been collated and published in such an accessible format”, confirms one contributor from Glasgow to the project. She adds that the initiative raises the profile of participating organisations. After completing the mapping process, a participating community or organization can have their map printed professionally. The goal of each and every of the 584 maps that are currently being built by communities in 54 countries is to reduce global warming. So far there’s no dedicated map showing the effects of global warming yet (perhaps a task we should be taking up). One reason no doubt is that it is anticipated that the effects of global warming will re-draw the world map significantly and doing that takes significant scientific training. If the IPCC’s worst case scenario comes true, vast parts of Europe and Scandinavia and coastal areas of all continents will submerge and up to 85% of the amazon could shrink. There are a few maps out there that document potential global warming effects the most notable of which is Google’s joint effort with the MET office and the Shell sponsored NationalGeographic map which both are pretty astounding despite the horrors they convey.